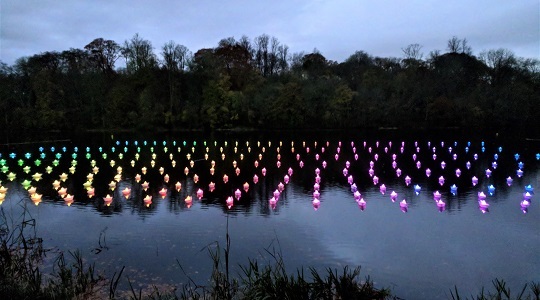 Aether & Hemera's Voyage has been selected for Blenheim Palace annual outdoor light exhibition; November 2017- January 2018. Our flotilla of origami boats will be floating for 2 months on the Great Lake. Photos by JW. The inspired work of Lancelot ‘Capability’ Brown has created a lasting legacy in the Park at Blenheim Palace. The visionary master landscaper constructed the Great Lake and planted thousands of trees in his ten-year tenure here, engineering a landscape that appears natural but is actually 'contrived to pleasing effect'.